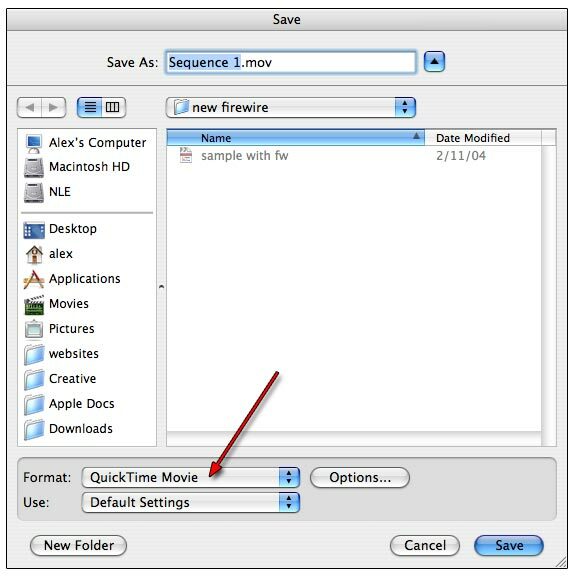 This is a very brief, down and dirty explanation of how to bypass Apple's compressor application and use QuickTime Conversion instead. If Compressor is giving you any trouble at all, you can use this method. Following the QuickTime Conversation process, an extremely brief instruction on using A.Pack to convert 2-Channel AIF to 2-Channel AC3 is also provided. 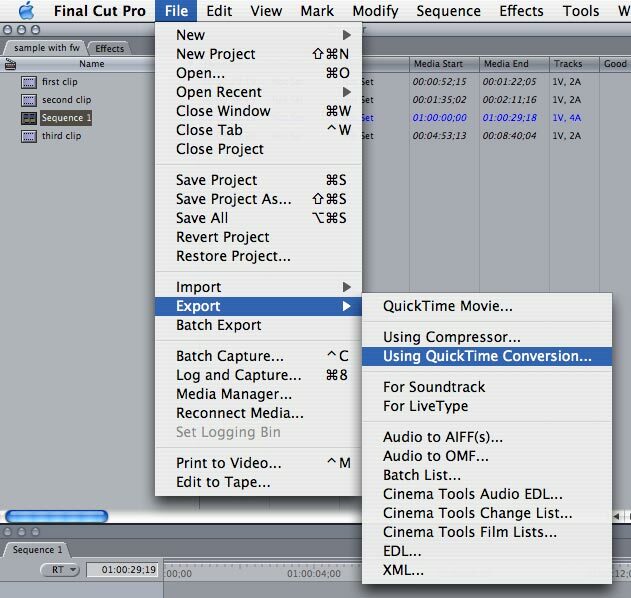 Within Final Cut Pro 4, select your completed sequence in the bin. A Save prompt will appear. At the bottom of the Save prompt box, choose Format. 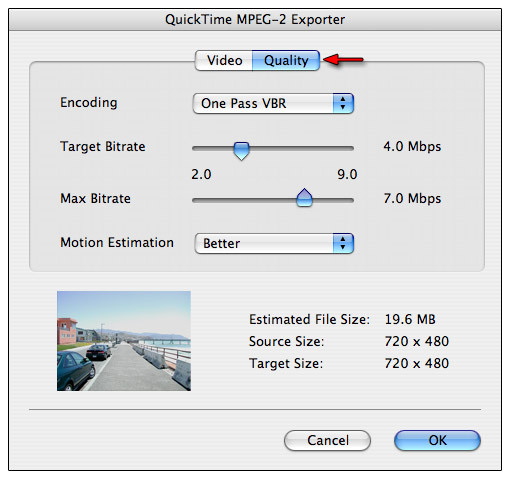 Using the format selection type, select MPEG2. 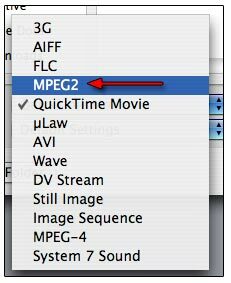 Once MPEG2 has been selected, choose the Options button. Here you can adjust the type of encode. CBR (Constant Bit Rate), aka One Pass, One-Pass VBR (Variable Bit Rate), or Two-Pass VBR (the slowest of all three). Note that the One Pass option does not state VBR, as the other two options state. Choosing this option will yield only the top slider for Target Bit Rate. Using VBR will allow you to set the the Target Bitrate and a Max Bitrate. The minimum difference between Target Bitrate and the Max Bitrate must be at least .5, however 1.0 would be better. Underneath these options, you have Motion Estimates. You can leave the default set to: Better, however Best is the best. Once you have made your choices, choose the final location where the .m2v and .aif files should write to for final output. 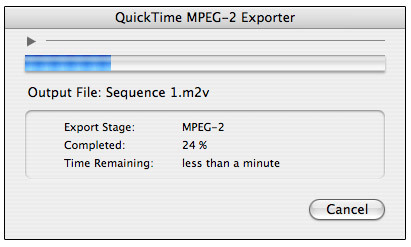 At this point, the encoder starts writing your MPEG2 and AIFF files to the hard disk. You can further reduce the size of the encoded AIFF file with the use of A.Pack. 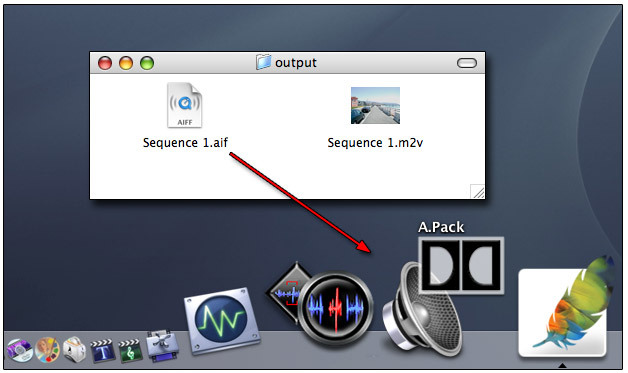 Launch A.Pack from either the /Applications folder or your dock, wherever you have it. 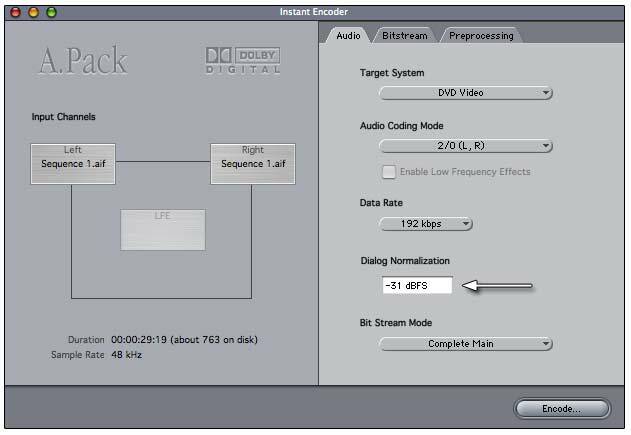 Drag the sequence AIF file to the left Input Channel on the Instant Encoder screen. You will be prompted to select an input channel. Since you used drag-and-drop on the left Input Channel, it will default its offer to bring in the left channel of the AIF file. Select OK. Do the same for the right channel. On the right side of the Audio tab in the Instant Encoder window, adjust the Audio Coding Mode from its default of 5.1 to 2/0 (L, R). Also adjust the Data Rate from its default of 448 kbps to 192 kbps. Set the Dialog Normalization to -31 dBFS. This ensures that sound levels will not be altered. Select the Preprocessing tab of the Instant Encoder. The default of Film Standard Compression should only be used when you are encoding an original mix intended for cinema. Change this setting to None. You are now ready to encode. Note the default extension of the file type is no longer AIF, but instead, AC3. Choose the file destination and select Save. Your AIF to AC3 encode begins. You should now have an .AC3 file in addition to the .AIF file. You only need one. You can now import the .m2v video and .AC3 audio assets into the asset bin of DVD Studio Pro 2 and prepare your DVD project.